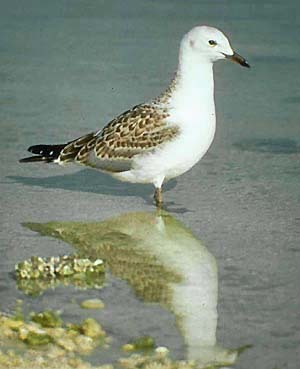 Gulls are ubiquitous denizens of temperate shorelines around the world. 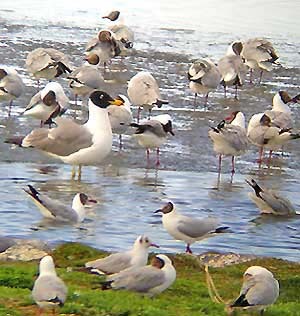 Many species are large and conspicuous and everyone in the northern hemisphere can recognize a "gull," even if they think they are boring (flock of California Gull, above). Only birders realize that gulls are extremely complex and interesting. Larger species take four or more years to mature and molt twice a year (one complete molt, one partial molt for most species), so there are thus at least 8 plumages (including the briefly worn juvenal plumage) to learn, not to mention the effect of wear or albinism. There are graceful and exceptionally beautiful gulls, like the sea-going Sabine's Gull (left; in juvenal plumage, attracted to our boat on Monterey Bay). It breeds high in the Arctic, then migrates far offshore to wintering grounds in the southern hemisphere. Another lovely and specialized gull is the tundra-breeding Ross's Gull (right; an adult). This delicate beauty, lightly flushed with pink in summer, is a highly sought-after prize. This is particularly true when it wanders south in winter and appears as a vagrant is such unexpected places as coastal Massachusetts, or Chicago, Illinois. One eventually reached California in Nov 2006 — at the Salton Sea, no less! — where many eager birders enjoyed it, but my chase trip was a few hours too late. The potential for vagrancy and the complexity of plumages has spawned an intense interest in gulls in recent years. Hybridization and introgression among large larids further complicates matters, intriguing some and disgusting others. Information continues to accumulate at a rapid pace, some of it available on-line (see below). One of the most unusual gulls is the night-feeding Swallow-tailed Gull (left; a first-year bird) of the Galapagos. It feeds primarily on spawning squid (Belopolsky & Tsigankova 1985); note the black eye-patch on the young bird (right) that is an adaptation for night feeding (see Hailman 1964). We are only now learning that worldwide climactic events, particularly irregular and major El Niños, significant impact distribution in southern and tropical species. During the great El Niño of 1982-83, for example, warm water washed over the Peru Current and oceanic productivity dropped to nil. All Swallow-tailed Gulls were dispersed (Alival et al. 1983), some reaching to 42°S off Chile (Peter Harrison, in litt.) and another showing up in Panama (Reed 1988). Some must have dispersed far to west and north. In June 1985, as post-El Niño productivity returned, one such adult made landfall at the nearest seabird colony and began engaging in routine breeding behaviors, such as extensive foot-staring (see Hailman 1965). The rocky gull colony chosen by this adult Swallow-tailed Gull was on the shores of Monterey Bay in my home town (Pacific Grove). What a fantastic vagrant! Yet, for reasons more impacted by "philosophy" and personalities than science, this long-distance migrant was considered controversial because there were no "intervening" records, and it was eventually rejected on "natural occurrence questionable" grounds by records committees. This led to published comments that it was "presumably a ship-assisted bird" (Burger & Gochfeld 1996), a position at odds with the behavior of this species and without any evidentiary support (see Hailman 1964, Snow & Snow 1968, Harris 1970; my analysis during the California committee review back in the 1980s is reproduced here). Subsequently, another Swallow-tailed Gull appeared off California during the El Niño of the mid-1990s and it was unanimously accepted. The records committees finally re-reviewed the 1985 bird, and accepted it retroactively, some 15 years (CBRC) and 21 years (ABA) later. Some years ago I found a Glaucous-winged Gull Larus glaucescens in Nebraska — a first state record — during a freak April blizzard. A paper reporting this record (Roberson & Carratello 1996) is reproduced here. Photos: The flock of (mostly) California Gull Larus californicus was on Carmel River beach, California, on 24 Feb 2004. 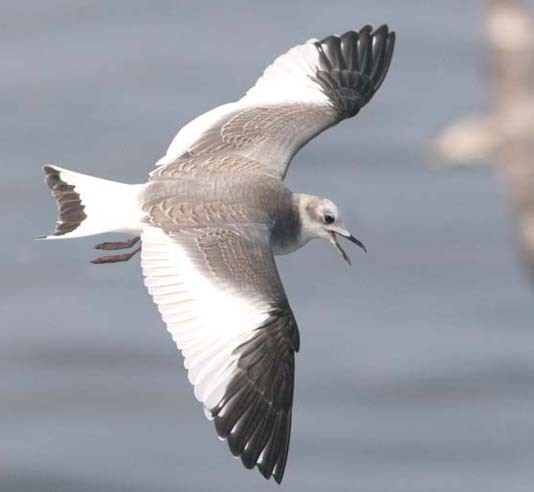 The juvenal Sabine's Gull Xema sabini was on Monterey Bay on 28 Oct 2007. 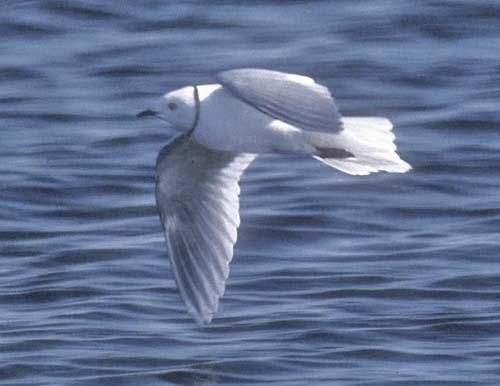 The adult Ross's Gull Rhodostethia rosea was at Churchill, Manitoba, Canada, in June 1988. 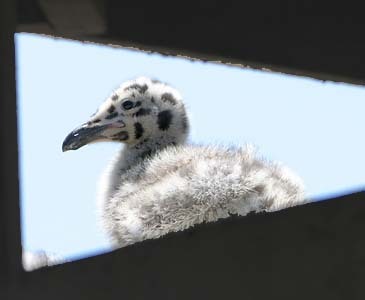 The Western Gull Larus occidentalis nesting birds (adult; chick) were at Moss Landing harbor, California, in June 2005. The gulls in the collage were at Fujairah, Oman, in Mar 2001; on Texel, Netherlands, in Oct 1991; at Qinghai Lake, China, on 18 June 2004; on Heron Is., Australia, on 25 Nov 1983, and in Moss Landing on 8 Jan 2004. The first-basic Swallow-tailed Gull Creagrus furcatus was a hundred miles off Ecuador at about 3°S, 82°W, on 29 Sep 1989; Peter LaTourrette photographed the adult Swallow-tailed Gull at Hopkins Marine Station, Pacific Grove, California, on 7 June 1985. 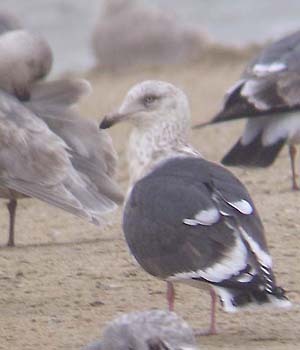 The 3rd-cycle Slaty-backed Gull Larus schistisagus was at Half Moon Bay, San Mateo Co., California, on 21 Jan 2004. All photos © D. Roberson, except the adult Swallow-tailed Gull © Peter LaTourrette, used with permission; all rights reserved. Bibliographic note: There is no "subfamily book" per se but there are books covering identification of northern hemisphere species, including the classic volumes by Peter Grant (1982, 1986). Olson & Larssen (2004) is the current state-of-the-art; Dunn & Howell (2007) is a competitor but a dense read (some nice photos, though). 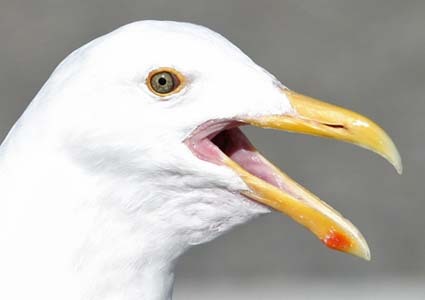 The literature is full of reference works on gulls. For example, the problematic Thayer's/Iceland identification situation is covered nicely by Lehman (1980), Zimmer (1990), and Zimmer (1991), among others. Alival, A., Fuenzalida, R., Herrera, G., Prado, L., Soto, R., and Zapata, B. 1983. Presencia del fenómeno "El Niño" en la zona costera de Iquique, con especial referncia al period 1982-1983. Amb. y Des. 1:133-136 [in Spanish, with English summary]. Anthony, A.W. 1895. Probable occurrence of Creagrus furcata off San Diego, California. Auk 12:291. Belopolsky, L.O., and Tsigankova, Z. K. 1985. New data on the ecology of the Galapagos Swallow-tailed Gull. Vestnik Zool. 1985:76-77 [In Russian, translation by V. Volmensky]. Binford, L.C., and D.B. Johnson. 1995. 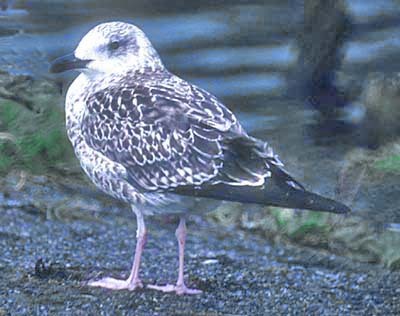 Range expansion of the Glaucous-winged Gull into interior United States and Canada. Western Birds 26: 169-188. Burger, J., and M. Gochfeld. 1996. Family Laridae (Gulls) in del Hoyo, J., Elliott, A., & Sargatal, J., eds. Handbook of the Birds of the World. Vol. 3. Lynx Edicions, Barcelona. Dunn, J., and S.N.G. Howell. 2007. 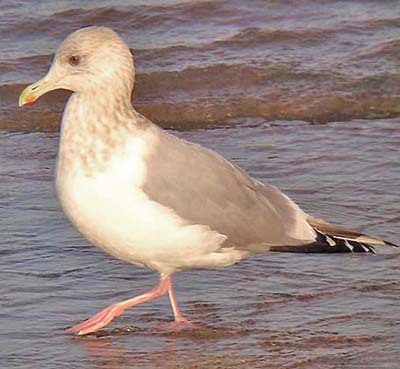 Gulls of the Americas (Peterson Reference Guides). Houghton Miflin, Boston. Grant, P. J. 1982. Gulls: an Identification Guide. 1st ed. T. & A.D. Poyser, Stratfordshire, England. Grant, P. J. 1986. Gulls: an Identification Guide. 2d ed. T. & A.D. Poyser, Stratfordshire, England, and Buteo Books, Vermillion, S. D.
Hailman, J.P. 1964. The Galapagos Swallow-tailed Gull is nocturnal. Wilson Bull. 76:347-354. Hailman, J.P. 1965. 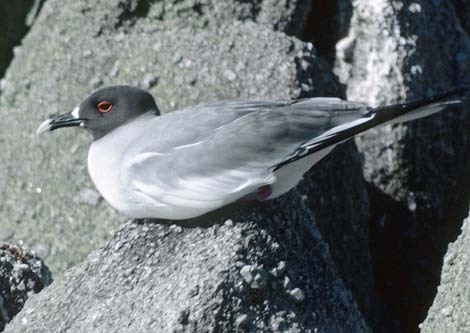 Cliff-nesting adaptations of the Galapagos Swallow-tailed Gull. Wilson Bull. 77: 346-362. Harris, M.P. 1970. 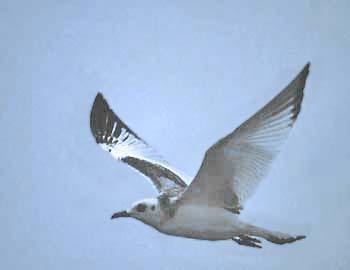 Breeding ecology of the Swallow-tailed Gull, Creagrus furcatus. Auk 87: 215-243. Lehman, P.E. 1980. The identification of Thayer's Gull in the field. Birding 12: 198-210. Olsen, K.M., and H. Larsson. 2004. Gulls of North America, Europe, and Asia. Princeton Univ. Press, Princeton, N.J.
Reed, J.R. 1988. Inca Terns in the Bay of Panama during the 1982-1983 El Niño event. Am. Birds 42:172-173. Roberson, D., and R. Carratello. 1996. First record of the Glaucous-winged Gull for Nebraska. Nebraska Bird Review 64: 3-4. Roberson, D., and C. Tenney, eds. 1993. The Atlas of the Breeding Birds of Monterey County, California. Monterey Pen. Audubon Soc., Carmel, CA. Snow, B. K., and D.W. Snow. 1968. Breeding behavior of the Swallow-tailed Gull of the Galapagos. Condor 70:252-264.
Zimmer, K.J. 1990. "The Thayer's Gull complex," pp. 114-130 in Field Guide to Advanced Birding by K. Kaufman. Houghton Mifflin, Boston. Zimmer, K.J. 1991. Plumage variation in "Kumlien's" Iceland Gull. Birding 23: 254-269.